South Africa is a hotbed of shark activity, best known for cage diving with Great White sharks around Cape Town. The country however has an astonishing diversity of sharks that can be seen from the warmer waters of Kwa-zulu Natal to the cool water of the Cape. To scuba dive with the biggest variety of large sharks in South Africa descend at Protea Banks in KwaZulu Natal. Here you can swim with Tigersharks, Zambezis, Black Tips and sometimes massive shoals of hammerheads. Other than cage diving with Great white sharks, diving with sharks in the Cape is a relatively young activity. Populations of these awesome animals accessible to scuba diving have only been discovered by divers in recent years. There are 3 completely different shark diving expeditions that can be done as day trips from Cape Town. 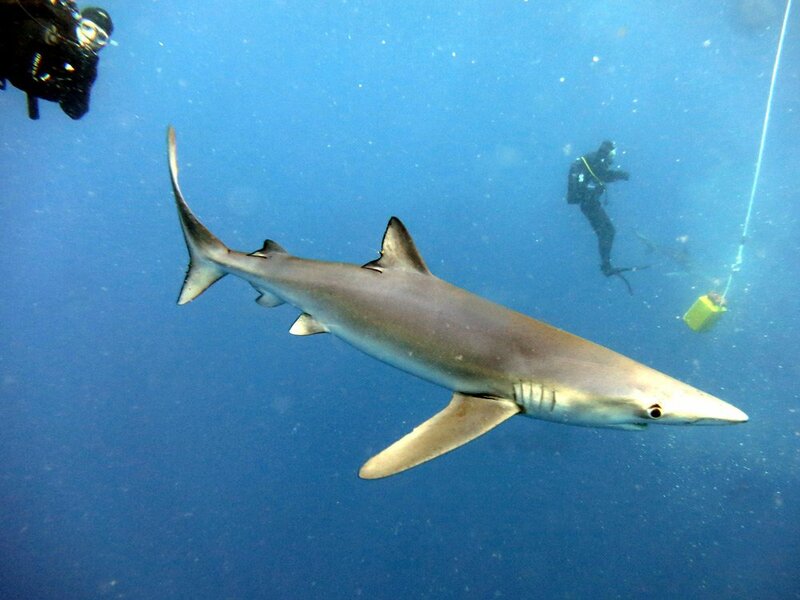 These experiences differ regarding the kind of sharks seen, the type of diving and the environment explored on these dives. Diving with the seven gill cow sharks at shark alley near Simonstown is an awesome experience. These sharks become big, with animals over 3m sometimes seen. They are often found hunting in packs of up to about 15 sharks, from there the name ‘wolves of the sea’. Cow sharks have seven gill slits instead of 5 like most sharks. I have dived with hundreds of these sharks over the years, they are very inquisitive sometimes coming right up to you, this makes for great photos. They are not aggressive, but they have real teeth and have been known to eat seals, so they can bite! So don’t touch them, treat them with respect and you should be fine. 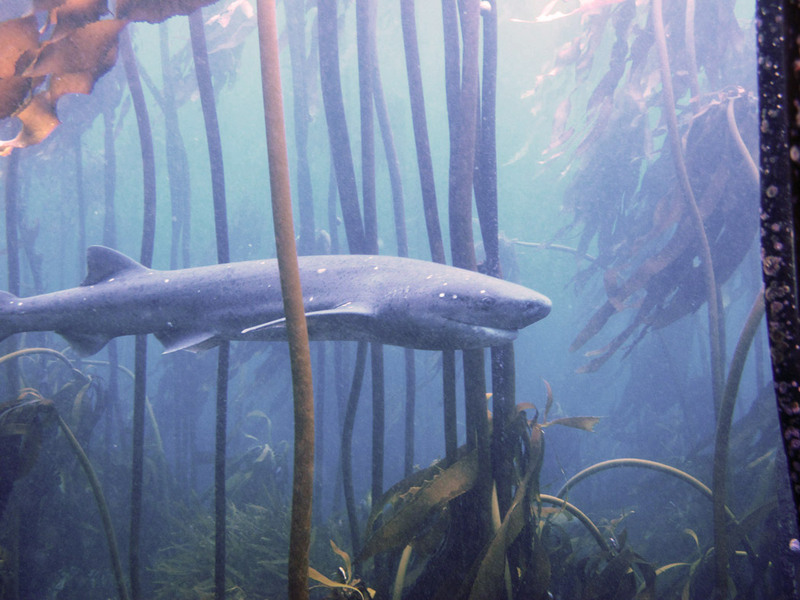 Falsebay is the only place in the world where high concentrations of cow sharks are found in shallow water close to the shore. They are often seen in the shallow channel between Pyramid rock and the shore called shark alley. This is an easy shore dive swimming from the slipway towards pyramid rock. Diving in the kelp forest is an fantastic experience and other than sharks a huge variety of fish and nudibranches (colorful sea slugs) can be seen on this dive. Other than the cow sharks, maller spotted gulley sharks and several species of cat sharks are found in this area. Diving with Seven Gill Cow Sharks at Pyramid Rock near Simonstown. This can easily be done as a shore dive. It is a shallow dive so it is suitable for all levels, if you are not experienced in local conditions I would recommend you dive with a local dive leader. The advantage of doing it as a boat dive with a local company is that the skippers have intimate knowledge of the area and will drop you on the sharks. 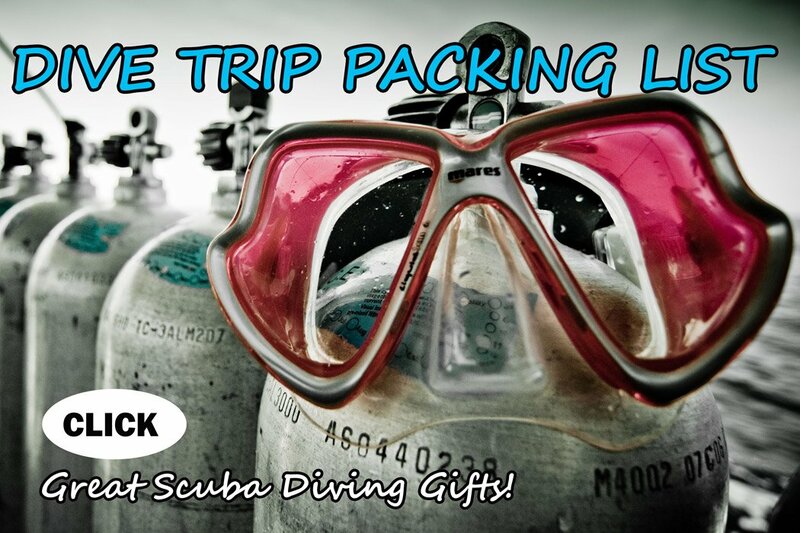 The Pisces Divers ‘sharks and seals package’ is a great option to see these sharks. You can dive with the Cow Sharks at shark alley and the Cape Fur Seals at Partridge point. The sharks often disappear for long periods, so check with Pisces if they are present when booking this dive. A Cat Shark, Red Roman and Cape Knife Jaw, diving around pyramid rock. This adventurous pelagic shark dive with Pisces Divers is something unique for even most experienced divers. Floating in the crystal clear, warm water of the Agulhas current hoping for predators to come and investigate is an exhilarating experience. 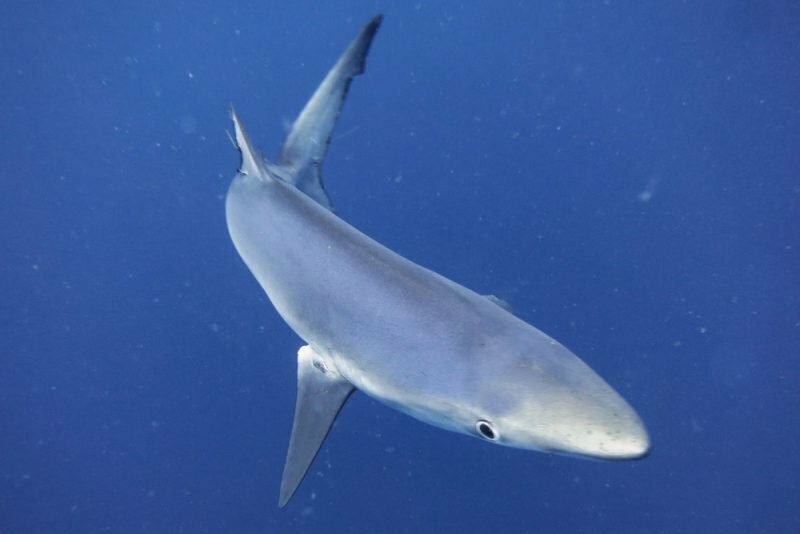 Blue sharks is the most common species seen on this dive, mako sharks often show up, but out here in the deep blue anything is possible and anything from whales to yellow fin tunas can come and surprise you! Our day with the Pisces Divers team started early, we launced their big But Cat at 7am. Sea conditions were fantastic and we had a very comfortable ride out of about 90 minutes. On the way we saw many cormorants, cape gannets and were lucky to have an albatross flying around the boat! Skipper, Neil, really knows his birds and I definitely learnt a couple of things from him during the day. It was not only birds during the ride out, we also so a whale, a sunfish and several seals kilometers off shore! The experienced team keeps an eye on water conditions, like temperature and color and stopped about 30 kilometers from Cape Point when they thought conditions had some sharky potential! Mike and the crew started creating a chum line behind the boat to lure sharks by cutting up pilchards. When the first sharks began to arrive a very exited crew started to kit up! We dived around a bait bin for about 75 minutes. What luck we had with 5 blue sharks and 2 mako sharks on our dive. A Blue shark eating around the bait bin during a pelagic dive. The graceful blue sharks were very calm and inquisitive, swimming around us and getting very close sometimes for the whole duration of the dive. Their big eyes help them to see better in deep water while hunting. These sharks feed mostly on squid and a variety of fish. Blue sharks can grow up to 3.5 meters, the specimens on our dive were all between 1 and 2 meters in length. 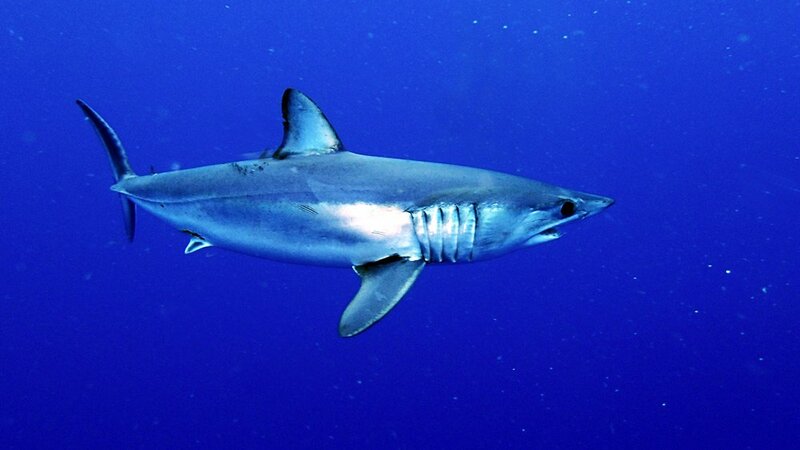 These pelagic sharks are actually the most common sharks in the ocean. Many divers travel here with the hopes of seeing this incredible shark. It is a stocky shark that can grow up to 3 meters, but most specimens seen are about 2m long. It has a mouth full of teeth that are very visible and is the fastest shark in the ocean, reaching speeds up to 74km/h! Swimming at such speeds it has been seen to jump up to 9m high out of the water. It was incredible to have 2 of these sharks on our dive, they were around for 2 or 3 minutes and quite uncharacteristically were swimming around us and the bait bin slowly and appeared relaxed. A short fin mako shark during a pelagic dive with Pisces Divers. Visibility was an incredible 30m, water temperature 20C, we spent the whole dive between 5 and 10m deep, there was no max dive time, after 75 min our whole group surfaced. Viewing Great White Sharks from a cage is the most famous dive in South Africa with thousands of tourists ticking this activity of their bucket list every year. It is not really a dive, with participants standing in a cage suspended from the side of a boat. The sharks are lured to the boat with bait and the massive Great Whites can often be seen from up close. Cage diving can be done around seal island in False Bay from Simonstown, but is seasonal with sharks only being in the area from February to September. Great White sharks can be seen from Gansbaai, about a 2 hour drive from Cape Town all year round. A couple of ‘divers’ watching a bronze whaler shark during a cage dive from Gansbaai. 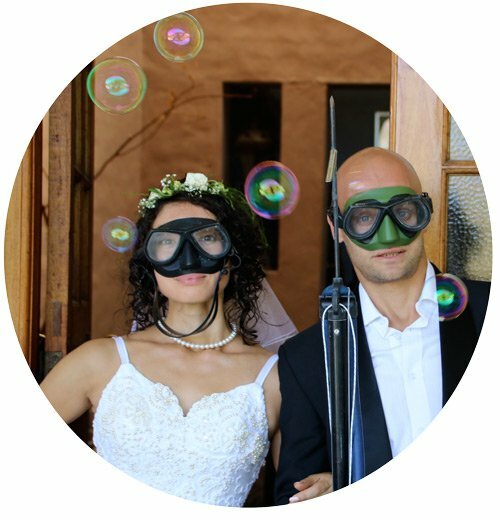 The Hotel Glencairn is a very convenient stay for diving in False Bay. Nice rooms, friendly owners and excellent location less than 100m walk from Pisces Divers. At about $55 (R650) for a room with a balcony and sea view you are not going to find much cheaper. This post was sponsored by Pisces Divers, photos and opinions is our own.